These Chocolate Covered Rosé Champagne Strawberries are really fancy and fun twist on regular chocolate strawberries. 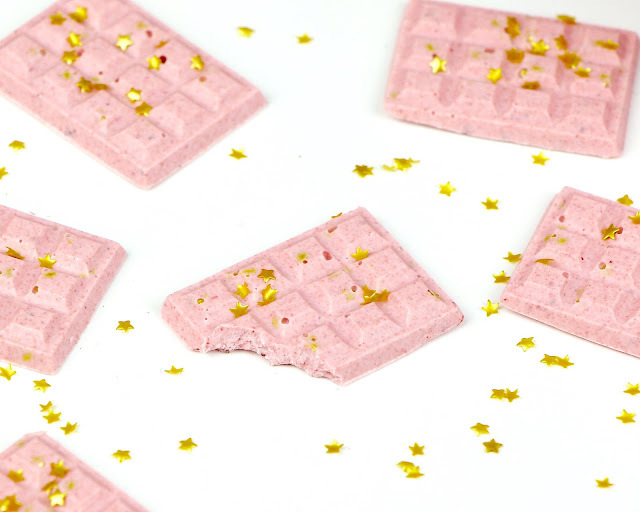 These are like the most fun adult dessert ever. They combine all of the best things, like chocolate and pink and champagne all in one pretty little treat. 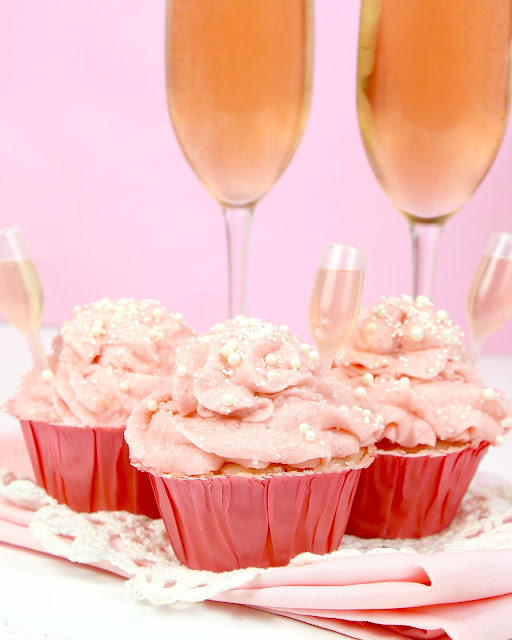 They're perfect for a wedding shower or a romantic occasion, or a fun girl's night or special brunch. 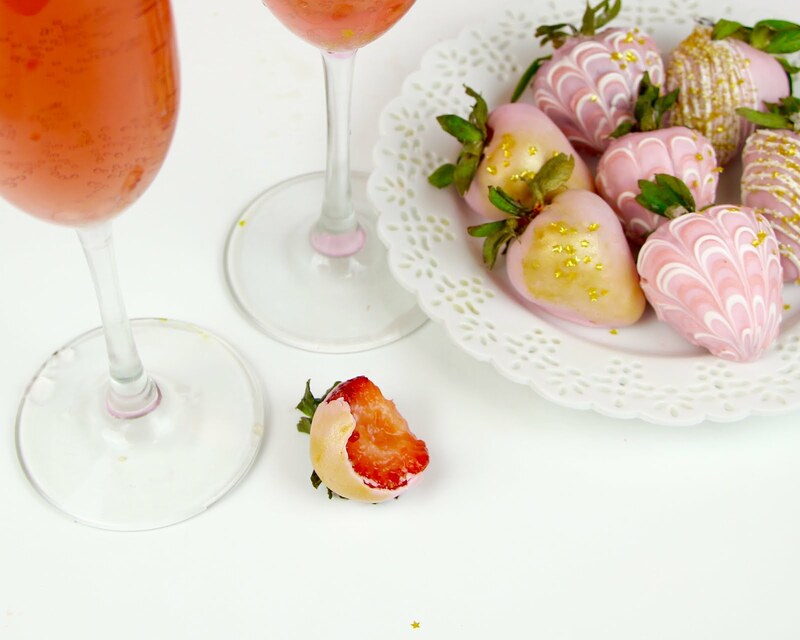 The strawberries soak in the Champagne over night to soak up all that sweet rosé. 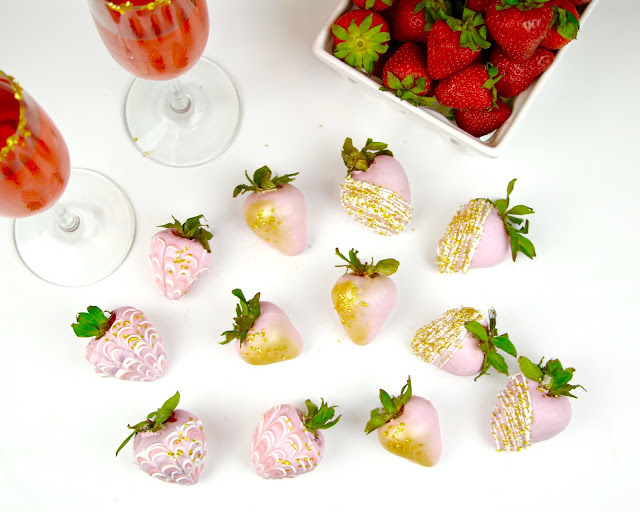 Then we dip them in a silky pink chocolate coating and decorate with sprinkles. 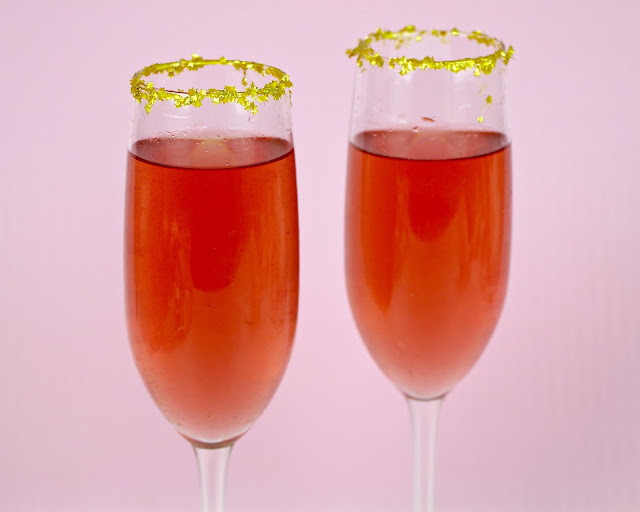 The longer the berries soak in the rosé, the more sweet champagne they absorb, so you can leave these in the fridge for anywhere between 20 and 36 hours, depending on how you like them. How cute did these turn out? 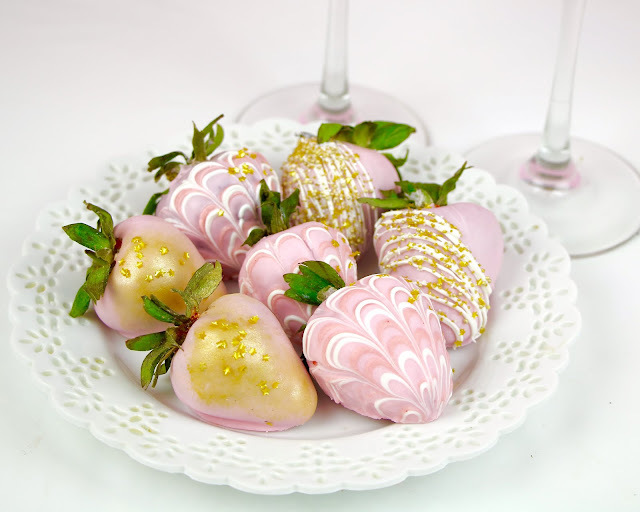 I like to serve them on a glass of champagne, with edible gold stars around the rim, for a fancy touch! Just wet a paper towel with champagne, run it around the edge of the glass to get it sticky and then roll in a plate of edible gold stars, or sprinkles. 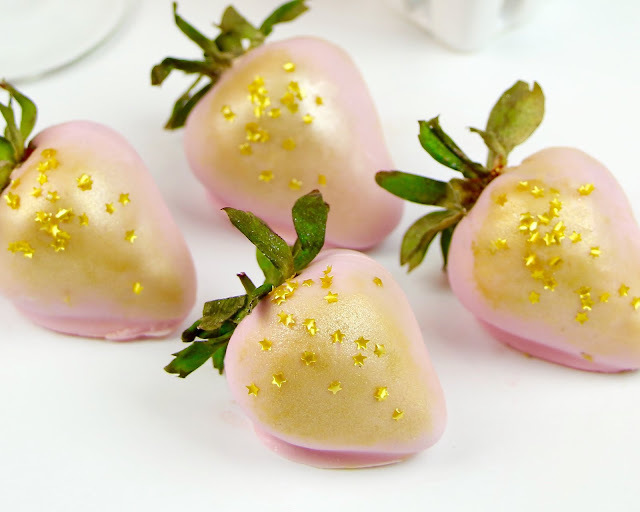 I used pink candy melts and gold sprinkles, but you can use regular chocolate, or any color combination you want to match the theme of any event of special occasion, to really customize these. 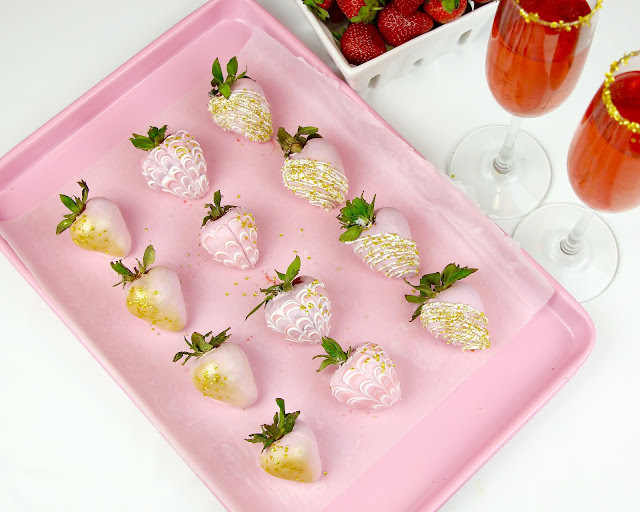 For this fancy look, drizzle on white and dark pink lines across the berry while the coating is still wet and drag a toothpick down, from the top to the bottom. Then add some edible gold stars or sprinkles to the top corner. For this gold look, let the pink coating dry and then dab the edge with a paper towel soaked in champagne and add some edible gold dust and edible gold stars or sprinkles. For this more classic look, drizzle on white diagonal lines across the berry once the pink coating has set. Then add some gold sprinkles on top. 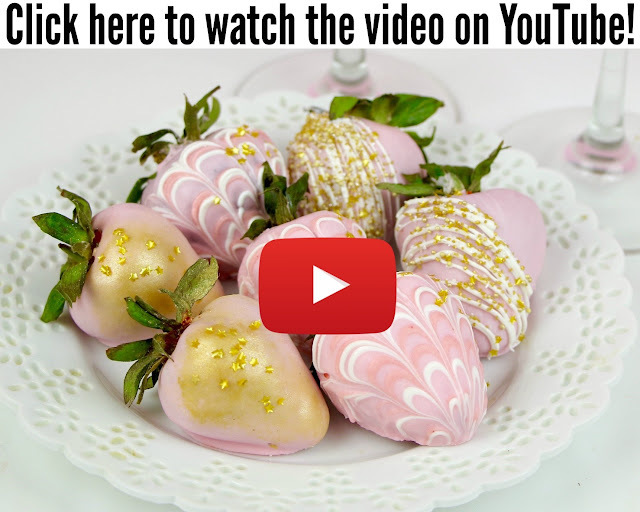 ...or my strawberry chocolate bars, so be sure to check those videos out too! 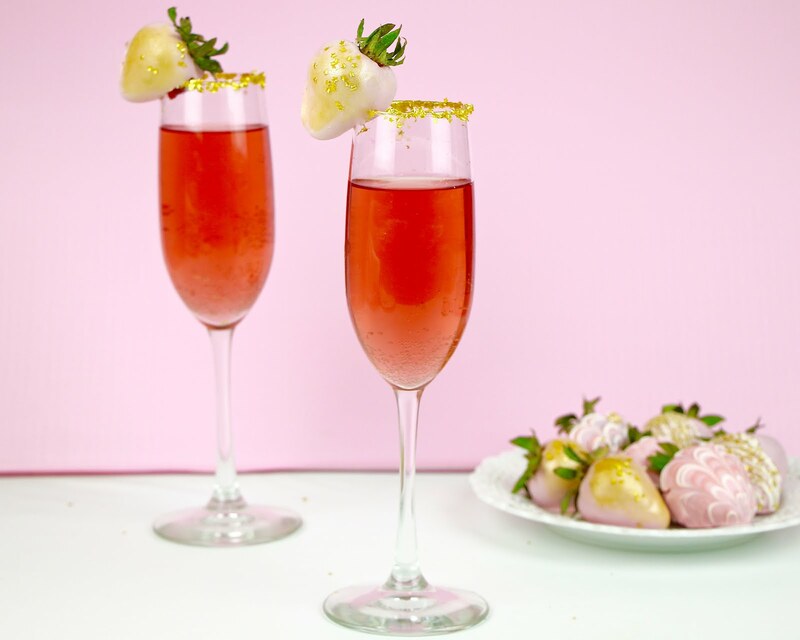 If you give this a try be sure to tag me in a picture on social media @lindsayannbakes, or share this video with somebody who you know would love these fancy champagne berries! 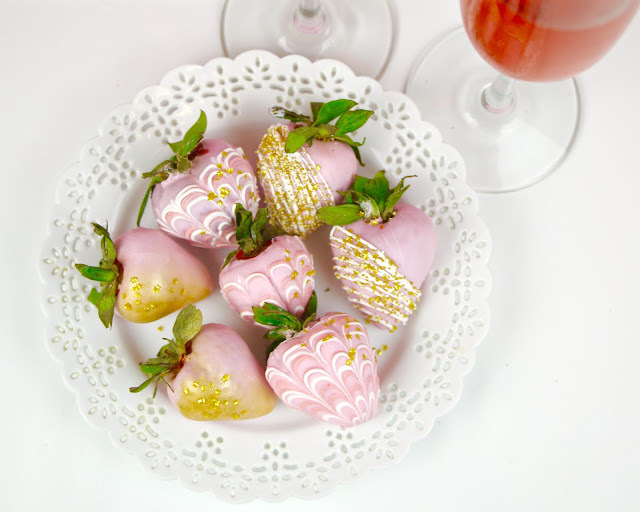 When you bite into these, the snap of smooth chocolate shell is the perfect coating to the sweet juicy berry that has that kick of bubbly Rosé flavor. Wash strawberries and pat dry. 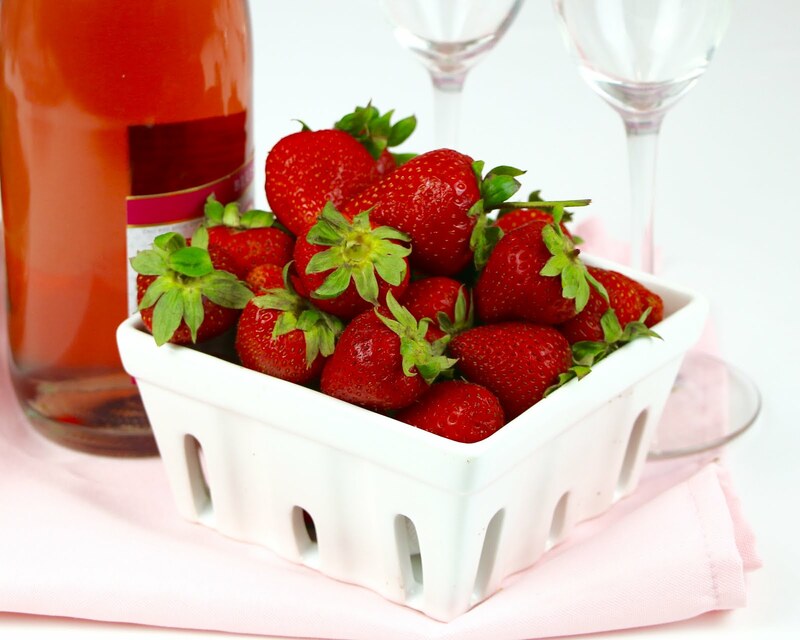 Fill a large jar or bowl with the strawberries. 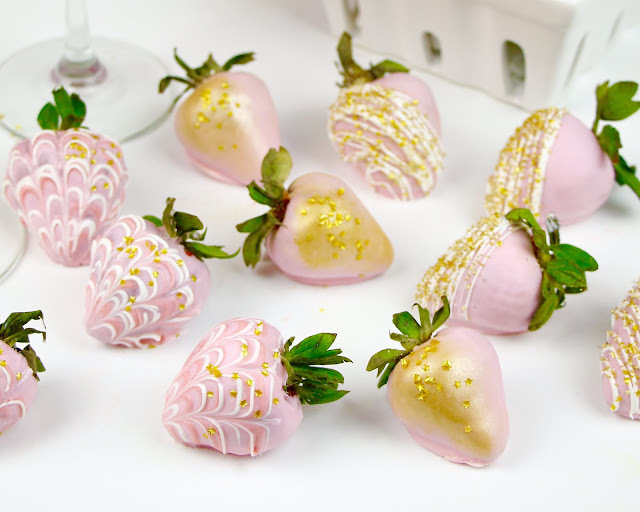 Pour Champagne over the strawberries until they are all covered. Cover with plastic wrap and let sit in the fridge for 24 hours. 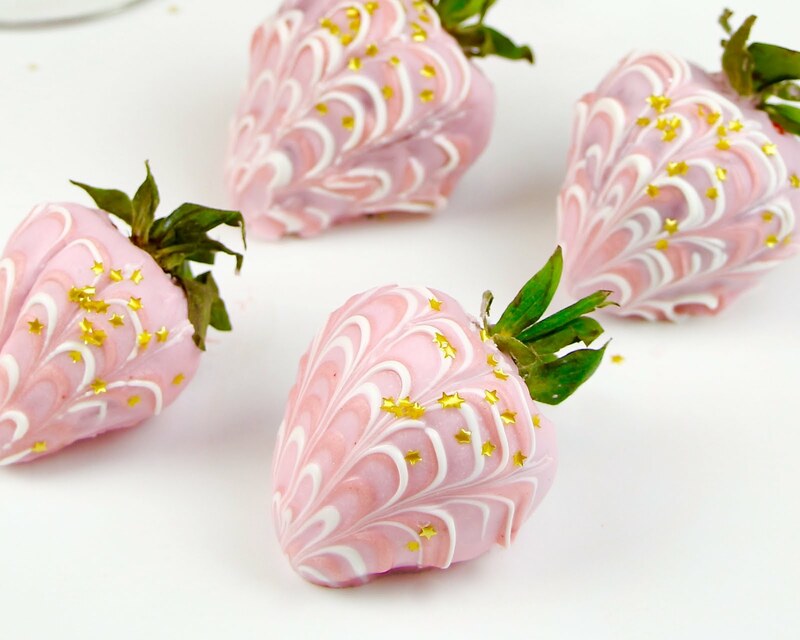 Remove strawberries and dry fully with paper towels. Make sure they are completely dry on the outside or the chocolate will seize up and ruin the smooth consistency of the chocolate. Melt chocolate according to package directions. Add vegetable shortening or oil to get a velvety smooth and thin consistency, perfect for dipping. Pour chocolate into a deep mug or cup. 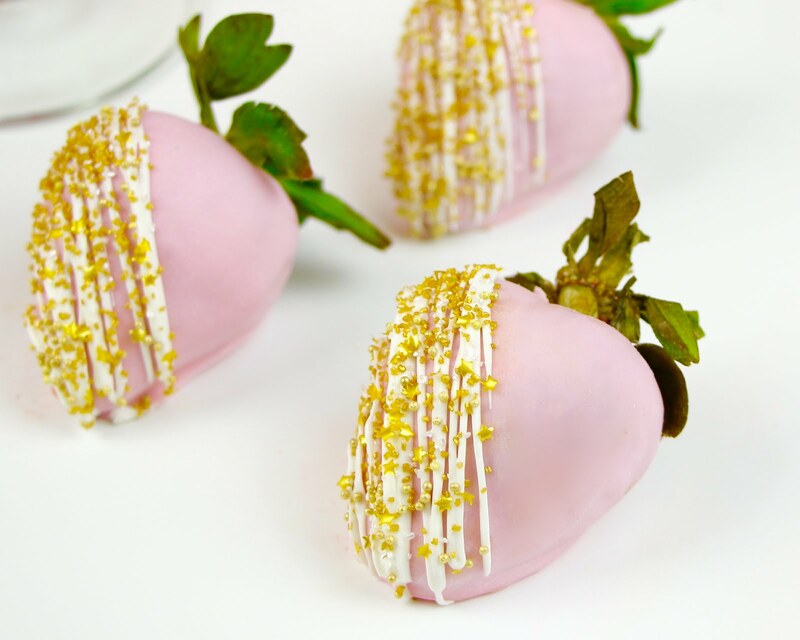 Hold the strawberries at the leaves and dip into melted chocolate until it is fully coated. Pull straight up and out of the chocolate. 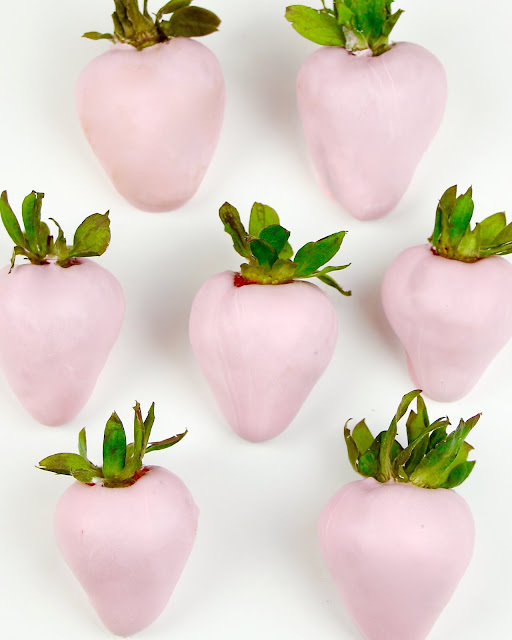 Use your free hand to tap the wrist of the hand holding the strawberry to help the excess chocolate slide off of the tip of the strawberry and back into your cup. 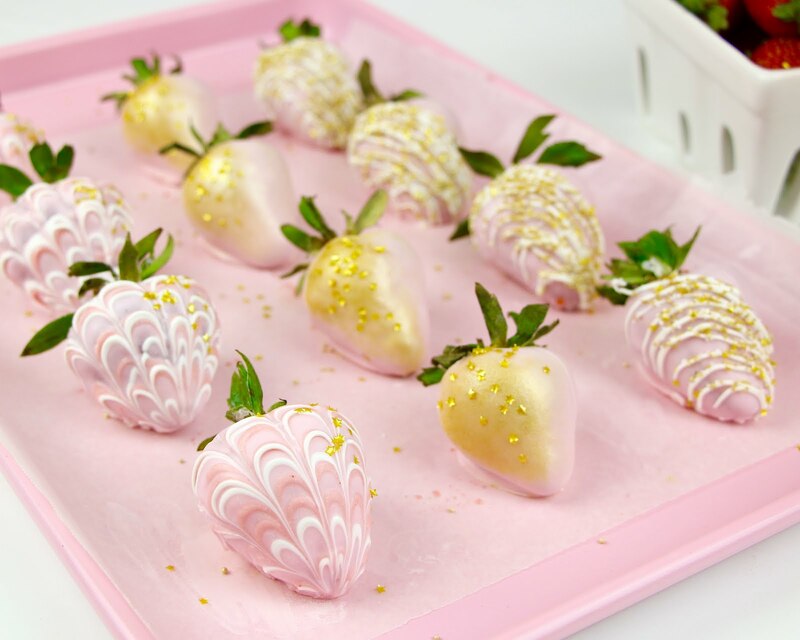 Place dipped strawberries onto wax paper. 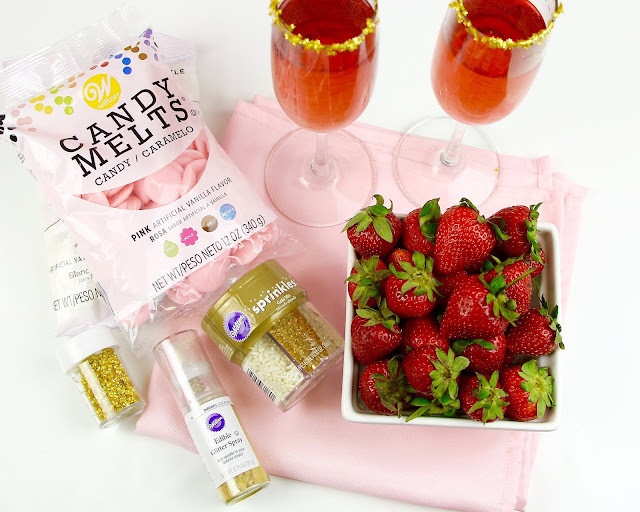 Add sprinkles or edible pearls, or snip off a tiny tiny piece from the corner of the bag and gently squeeze on to dried dipped berries, moving your hand from side to side in a quick and steady motion. Add sprinkles if desired or run a toothpick from the top down, to create a fancy design. 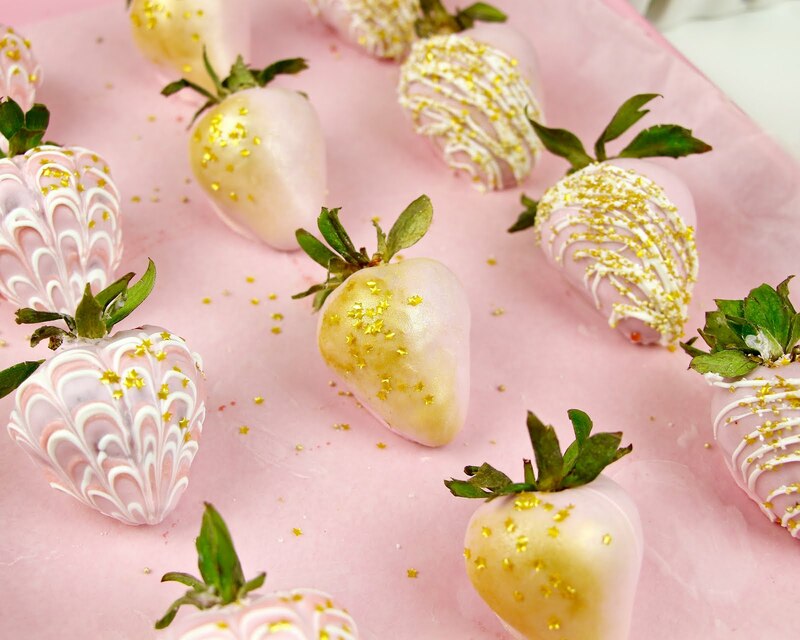 Let strawberries dry fully, until chocolate has set (speed up the process by placing in the fridge or freezer for a few minutes). If desired, wet a paper towel with champagne, run it around the edge of a champagne glass to get it sticky and then roll in a plate of edible gold stars, or sprinkles. 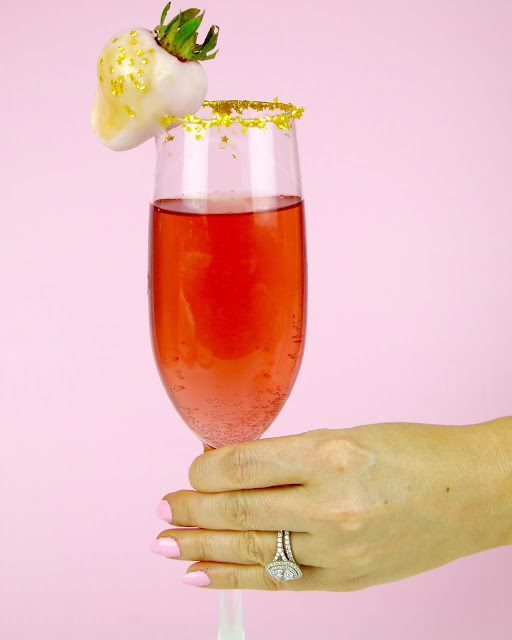 Add strawberry to the rim by making a slice on the side, so it stay on securly. Enjoy same day, or refrigerate if not serving immediately. These are best served within 24 hours of dipping. 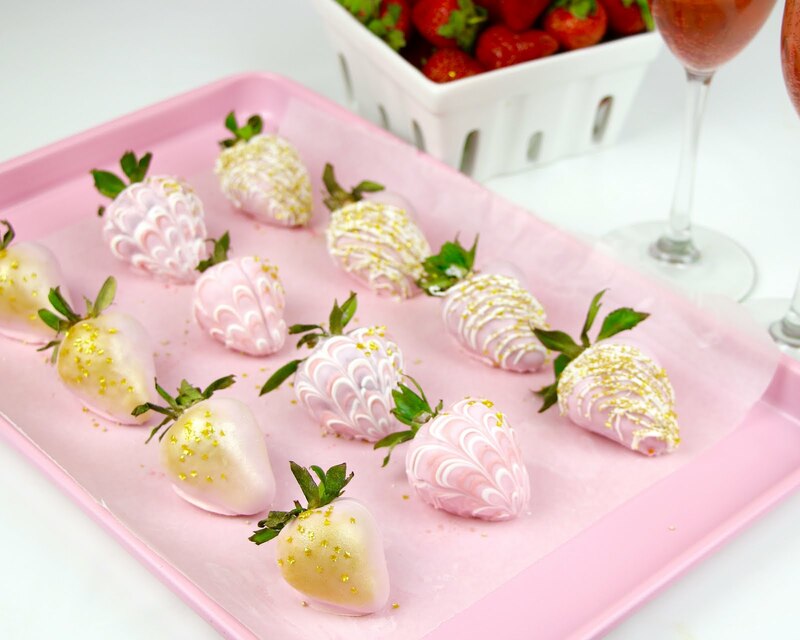 Note: if you leave the chocolate dipped strawberries in the fridge, condensation might form and you will have water droplets on top of your strawberries or in between the berry and the chocolate, when you remove them from the fridge and they come back to room temperature.